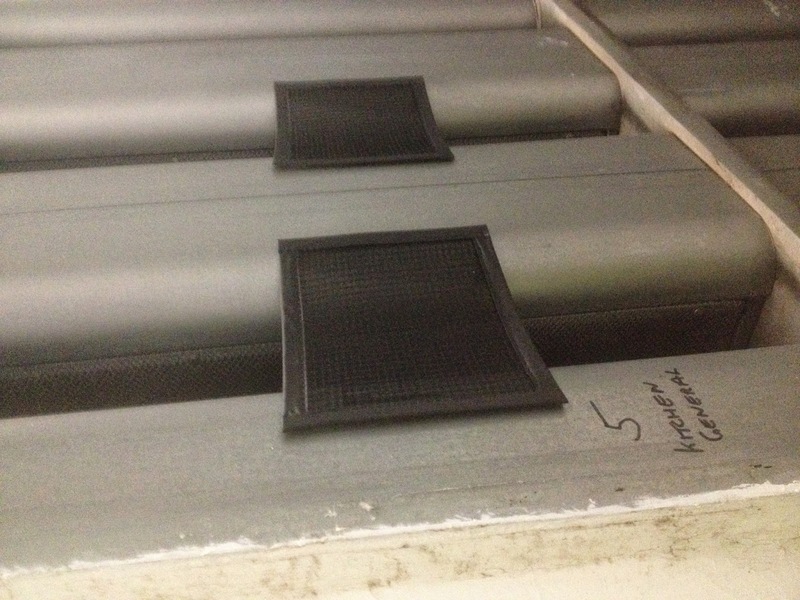 A major army garrison in the South of England had recently been redeveloped with new duct mounted frost coils located in the chambers behind the air intake louvres. The fans were fed from a common intake chamber which then distributed air throughout the main restaurant and welfare facilities used by the troops when in the UK. Bars, canteens, lounge areas, shops and banking facilities were all fed from this one common intake system. The frost or heating coils are located in front of the main filter system and heat the air before it reaches the main air handling unit with its heating and cooling coils. Because there is no protection the airborne particles, particularly pollen and seed, are drawn into and clog up the frost coils during the summer months. As the need for pre-heating arises these coils must be fully cleaned to ensure full efficiency of airflow when it is needed during the winter season. The coils were not easy to access and the cleaning operation required that the louvre be removed and an operative climb into the duct to gain sufficient access to fin comb and vacuum the coils. Faced with this time consuming and problematical cleaning issue (withheld for security reasons) contacted Richard Betts of RAB Specialist Engineers Limited to demonstrate the Permatron Air Intake Filter Screen. Each air intake grille could be individually protected using the made to measure Prevent® equipment protection filter in both vinyl border with drop tab fasteners and the unique magnetic framework design. And now the garrison recreational facilities will be protected with the new air intake screen keeping the frost coils and the existing filters cleaner for longer. RAB Specialist EngineersLimited and Permatron Corporation doing our bit for the troops.